Cast : Hugh Jackman, Nicole Kidman, Brandon Walters, Bryan Brown, David Gulpilil, David Wenham, Jack Thompson, David Ngoombujarra, Ben Mendelsohn, Essie Davis, Barry Otto, Kerry Walker, Sandy Gore, Jacek Komen, Max Cullen. Synopsis: A rich English woman travels to Australia in 1939, to sell off the cattle station owned by her husband. When she arrives to find her husband dead, she decides to complete his life’s work, with the help of a mysterious Drover and a young Aboriginal boy, to save the station from being sold to the unscrupulous King Carney, property baron of the north. And just when you think it’s all cool, Darwin is bombed by the Japanese. Review : Lavishly mounted historical-epic-romance, tinged with mystery and the mystical, allows Nicole a decent role for a change, and Jackman the chance to once again prove why he is such a great screen presence. Told in the style of a mythical, grandiose, music-video-mixed-with-dramatic-hysterics, Australia is a film destined to polarise audiences who will simply not engage with what Luhrmann is trying to accomplish, or be swept away on it’s epic scale and size. Occasionally descending into overblown melodrama, Australia is as much a film about the history of our great country, as it is a way of rekindling the magic our wide, brown land has to those who do not live here. For those reading this who live outside Australia, it will be hard to determine just how a film like this will be perceived in the country the film takes it’s name from. 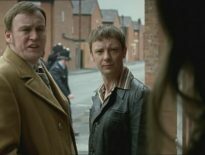 It’s backed by Australians, filmed here, produced here, all the actors are from here, in fact, almost every aspect of this production is a local effort. Thusly, Australians have every right to be proud of the product we are launching upon the world stage. Australia, as a film, has had a somewhat rocky past. It began years ago, with the failure of Luhrmann’s Alexander epic to eventuate (which, in a small side-note, I’d love to have seen go up against Oliver Stone’s blundering epic of the same name!) the Australian director turned to something a lot closer to home. Out country’s history is not as lengthy as many others, Europe, the United States, for example: you guys have a vastly deeper cultural history than the land Down Under. Australia, for those looking for some background history, was colonised by the British in the late 1700’s, and became a nation (Federation) in 1900. Effectively, we only have 200 years or so of White Settlement history to work with. The Australian Aborigines, who can claim an earlier 40,000 years of history (that’s right, Forty Thousand Years!) were subjected to some of the most horrifying human rights abuses and immoral acts ever committed on an entire race. The entire Tasmanian Aboriginal population was wiped out, erased forever from the natural landscape they had lived in for thousands of years. Tasmania, for the geographically disinclined, is the apple shaped island to the bottom right of Australia, just below Melbourne. Heck, that’s what Google Earth is for. Anyway, when white settlers came from Europe, they subjected the local inhabitants to some awful punishments for the single crime of having different coloured skin. It’s an analogous situation to Black slavery and subjugation in the US, or perhaps even more analogous to the eradication of the American Indian tribes during the settling of the US. Australia has a long and chequered past, both good and bad. We’ve helped fight in both world wars, other wars in which we were never wanted, and should never have become directly involved. We stand shoulder to shoulder with other countries as part of the Commonwealth of Nations under British rule, and consider ourselves an ally to many nations across the planet. I love a sunburnt country…. Our country is the driest on the planet. The state I live in, South Australia, is the driest state in the country. We have the three or four of the most poisonous snakes on the planet roaming unfettered through our scrubland (you guys know it as the Bush) and our Outback contains some of the harshest, most inhospitable landscapes to be found anywhere on Earth. Women won the right to vote in South Australian elections in 1894, and it wasn’t until 1902 that they could vote everywhere else in the country. In 1983, we took the America’s Cup from the US in one of the greatest international sporting triumphs ever seen in our country. Our sporting elite and entertainers are among the most popular and widely regarded anywhere on Earth. Well, we don’t lay that claim to Russell Crowe, or perhaps even Mel Gibson (who got his big break here a few years ago.. we love that!) We have some of the cutest animals found anywhere on Earth: the Koala and Kangaroo are balanced out by the not quite so cuddly Tasmanian Devil, which, if you ever see a real one, is actually nothing like the Looney Tunes version you’ve all seen on TV. And our Kangaroos can’t bounce on their tails like the cartoon one does either. A land of sweeping plains…. Australia (the country) contains a population with one of the highest ethnic mixes anywhere on Earth. People from every country on the planet, including some you’ve probably never heard of, live on our shores. Our immigration policy is, by many standards around the world, among the harshest and most rigorous anywhere. For good reason. This is Gods country, folks. Vast deserts, ravishing tropical jungles, snowy mountain peaks and a more diverse ecosystem than anywhere else, including South America and Asia. Bold claims, I know, but when you come here, and you will, you’ll see why we love living here. Why am I telling you all this? Simple. Australia is a country many people know of, but not necessarily know about. Which is why, as part of the promotion for the film Australia, director Bazz Lurhmann was also approached by our tourism industry to make sure anybody not living here, wants to. Our Tourism Commission, which is essentially a bunch of salespeople sitting about a back veranda (porch) figuring out ways of enticing folks from overseas to come here and visit, hasn’t made a good fist of it lately. You may remember their previous effort, the “Where The Bloody Hell Are You Campaign” struck the wrong kind of image for our fair land, according to most overseas polls. (“Bloody Hell” is Australian for saying Dammit, or something like that) so it was with the greatest fanfare that Luhrmann and his crew filmed, on the side, a series of commercials for overseas consumption that presented a lavish, epic view of our wonderful country. Australia the film, which no doubt will come to represent, for some, our entire country, is the Down Under version of Gone With The Wind. An epic tale of love, struggle, with a backdrop of war and a country finding it’s feet amongst other nations, and finding it’s identity after Federation, Bazz Lurhmann has come up with one of the biggest challenges of his career. Not only does he have to sell his behemoth of a film to the foreign market, but he has to persuade his own countrymen to accept the film as well. 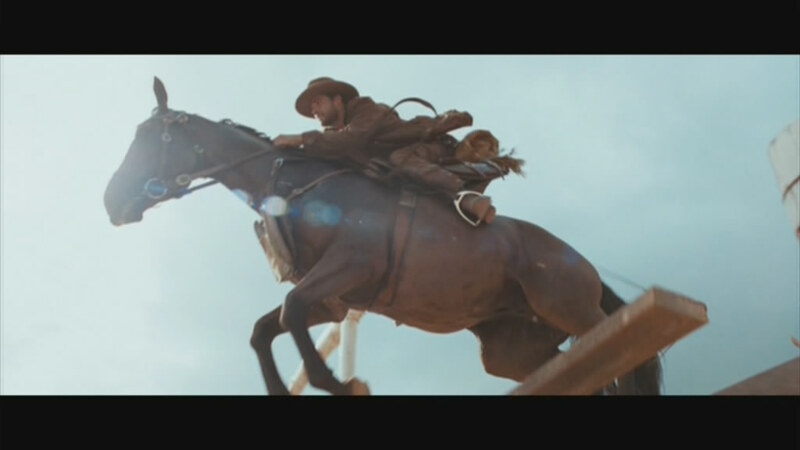 In the film, Nicole Kidman plays Sarah Ashley, a wealthy English landowner, whose husband has gone to Australia to run a cattle station in the far north of the country. In order to sell the land, and get her husband back, she travels to our fair country, only to find her husband has recently been murdered by a local Aboriginal Elder (apparently) and his cattle station, Faraway Down, on the brink of ruin. It appears that a local cattle baron, known as King Carney (Bryan Brown), who owns all the land across the north save for Faraway Downs, has been rustling cattle to maintain a potential monopoly on supplying beef to the Australian army. Carney’s right hand man, Neil Fletcher (David Wenham) has designs of his own, a seemingly unquenchable thirst to own everything in sight, a desire that causes brings him into conflict with Sarah. Sarah, however, has an unexpected ally, in a man known only as The Drover (Jackman), who she hires to make a cattle run from Faraway Downs to the docks of Darwin, to the waiting army vessel, to try saving her station from certain bankruptcy. Sarah also has to deal with the Australian governments policy on forced removal of Aboriginal children to Christian missions, as a young half-caste child lives about Faraway Downs, named Nulluh (Brandon Walters). The bigotry and racism towards the indigenous population is rife within the community, and Sarah is appalled by it. The Drover is reluctant to herd Sarah’s cattle across the desert, but when she manages to convince him to do it, he finds himself having to protect not only the herd, but the small disparate group of farmhands (including Sarah and Nullah) from death at every turn, no small thanks to Fletchers dastardly ways. 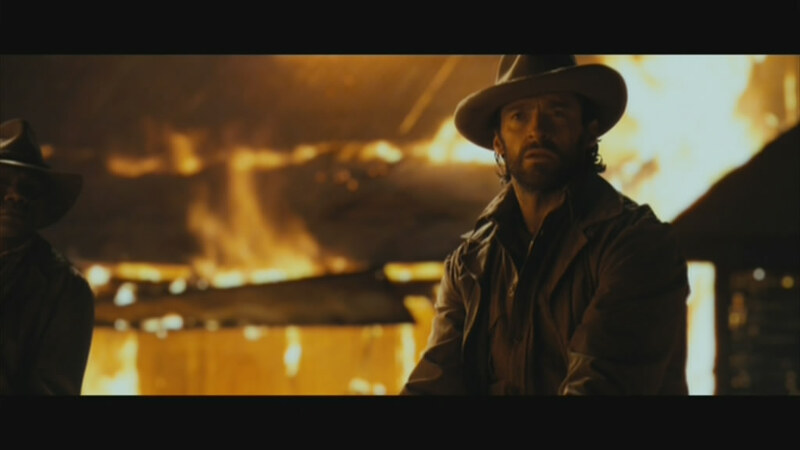 Hugh Jackman, as The Drover, makes his entrance. Australia is a film in two distinct halves, separated by a slight respite in the action by a sequence involving a local ball, in which Sarah and the Drover finally admit their feelings for each other, publicly. 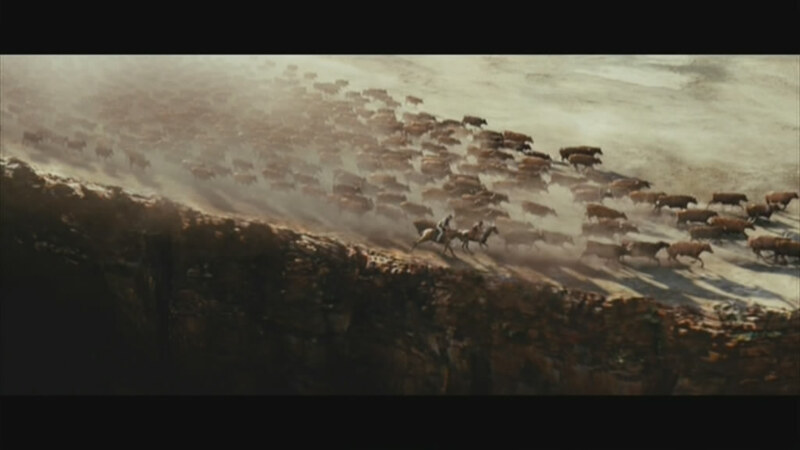 The first half of the film, however, is a mishmash of adventure, melodrama, and action, as the cattle drove is organised, and special mention must be made of the particularly thrilling “they’re heading for the cliff” sequence which brings the film to dazzling, heart pounding, life. To be honest, director Luhrmann has managed to fill this film with the same amazing visual style that he’s done for each of his previous efforts, even if the emotional overwroughtedness is somewhat lessened this time round. Kidman and Jackman are perfect casting as a screen couple, her fragile frame and uppity demeanour really clashing well with Jackmans drawling, muscular (literally and figuratively) portrayal of a man bereft of feelings due to past historical tragedy. The Drover, an amalgam of clichéd Aussie personalities, is held by Jackman to be almost a mythical, magical figure in the outback, a man capable of amazing feats of endurance and skill, while seemingly nonchalant about it to the point of embarrassment. Nicole Kidman cops a perv. 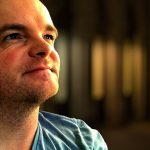 The opening half of the film is redolent of what foreign audiences would expect of a film about Australia: sweeping landscapes, magic sunset’s, men who talk with their fists and not their heads, and women as hard-bitten as any man alongside them. Cultural clashes between the characters may go over the heads of a foreign audiences, but here in Australia, we know these prejudices only too well. Luhrmann has taken the populist view of the White Australia policies that were prevalent at the time, painting those enforcing the governments laws as being unfeeling, uncaring one dimensional thugs (of sorts), which allows us to loathe them (and consequently the laws themselves) in an emotional manipulation done perfectly by the director. The single most talked about scene in the film. The second half of the film is where the crux of the emotional weight belongs, starting with the bombing of Darwin, and the frantic rush to save lives throughout. A tip of the hat to Michael Bay’s Pearl Harbor is evident, although during this sequence it becomes obvious that a large scale action sequence isn’t something Luhrmann is particularly fluent in, in terms of its cinematic prescience. The narrative in the second act is a little more laboured, a cataclysmic plethora of diverging storylines occasionally causing the audience to momentarily be pulled from the film as they try and figure out exactly what is going on. For me, the opening act is the better, a more stylish and less “realistic” look at our country in this case, far exceeding the more gritty warfare moments later on. That’s not to say they don’t have their place, but… well, we’ll explore this in a moment. The Man From Snowy River came back to see what all the fuss was about. Let’s just run through the good, bad and ugly of Australia. 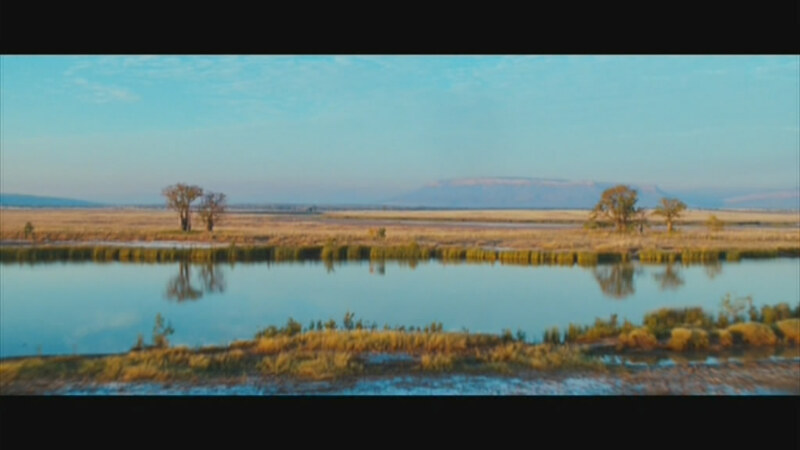 The film looks stunning, a veritable picture postcard moving at 25 frames per second. Not one square inch of this film is anything but gorgeous cinematography, and for this, DOP Mandy Walker is to be commended. The brilliant hues of sunset, the achingly gorgeous vistas and landscapes of the Never Never, the immaculate close-ups on our main cast, all of whom are beautifully photographed. Luhrmann has developed his sense of style through his film career, with the somewhat tepid (by comparison) Strictly Ballroom’s low-key look is blown apart by the dazzle of Moulin Rouge and now, Australia. The cast are uniformly excellent, especially young Brandon Walters, a local Aboriginal boy cast by Luhrmann in the pivotal role of Nullah. Walters delivers a performance so luminous, so ancient in tone yet still youthful in vigour, he is, perhaps, the centerpiece of the entire story. Indeed, Australia’s emotional core is built around his character, and Walters is so indelibly moving and convincing as Nullah, he helps let the audience really become entranced with the film simply by him being in it. If there was ever a piece of amazing child casting, alongside Dakota Fanning and perhaps that girl from The Piano, then Walters is it. Jackman, Kidman, Wenham and David Ngoombujarra (as the Drovers Aboriginal friend and helper) are all superb, carrying off their roles with spectacularly professional aplomb. Luhrmann demands a performance from his actors: no emotion is spared in this story, from the heady romance to the desperate search for survivors of Darwins bombing, and the grief surrounding it, Luhrmann insistently takes us on a journey where the well of emotion is ripped up and laid bare. 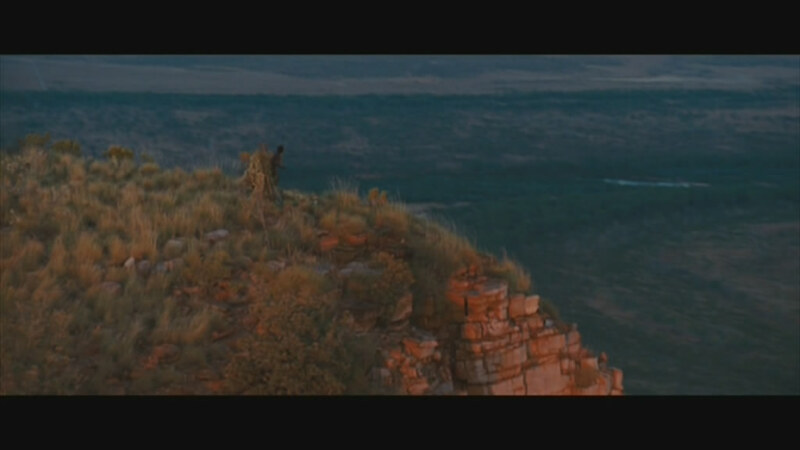 Kidman and Jackman fare the best, with their romantic entanglement played upon by the Aboriginal characters accompanying them on a drove across the desert. They have a great screen chemistry, and Luhrmann rides that for all he’s worth. 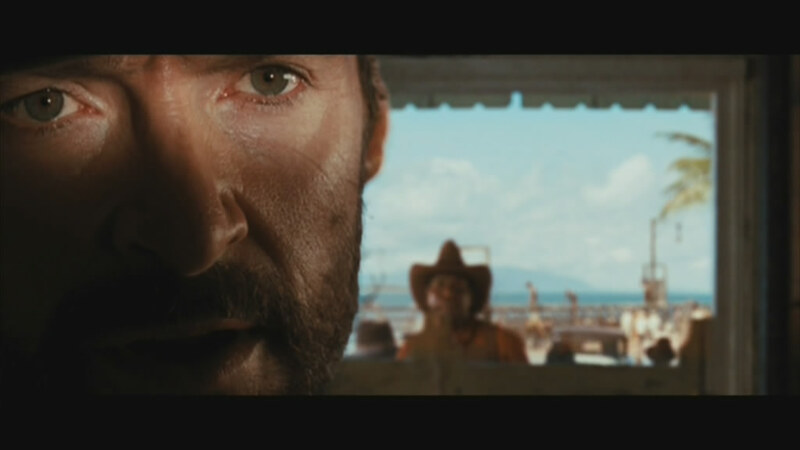 The opening half of the film, generally, is a prime example of style and substance mixing perfectly, a grandiose vision of an epic film, widescreen and surround sound, digital effects and immaculate production values. There’s a scene, when the herd of cattle are spooked, and begin charging towards a ravine, over which they certainly will plummet, where Luhrmann comes of age as a director of action. His grasp of large scale action, the beats and timing of a good old thrilling sequence of intensity, is amazing: he handles both tragedy and triumph in this moment with the deft assuredness of a director at the top of his game. If only the last Indiana Jones film had been this entertaining. The score: David Hirschfelders musical score is a triumph, an amazing mixture of old-style glory music (especially the moment when the Drover rides into the station, cattle before him, dust and dirt rising above the pounding hooves of a thousand head of beef, sweat and exhaustion playing large across his face, sunset a mere moment away) and subtle, sublime theatricality, incorporating Aboriginal themes, traditional orchestration, and even Rolf Harris’ Wobble Board. After Moulin Rouge, I was unsure of my chances of ever hearing such an opulent and perfectly rendered musical score to suit the on-screen visuals: I am glad to say I was not let down with the score for Australia. This is a musical soundtrack I would gladly shell out some hard earned on. If a film score is meant to encapsulate and enhance the visuals on screen, then Hirchfelder has succeeded in every single possible way. The opposing halves of the film, and there are most definitely two, just don’t quite gel together: in terms of a tonal difference, the opening act and the wartime second are poles apart. And it’s here that I think the biggest fault with Australia can be found. It’s almost like two different directors had a shot at making this film. One, the first act, is pure theatricality, in every sense. The grand landscapes, the sylised and somewhat magical look of the film’s first half is humorous, impish and often, exquisitely beautiful. The second act, where things go to crap, is as though Luhrmann was trying to get all sensible and realistic on us: a more typical Hollywood fare of death, carnage and destruction, with the most innocuously histrionic climax to date on screen, the tone looks more like Saving Private Ryan than the opening act’s similarity to Lord Of The Rings. The two halves of the film, albeit perfectly filmed in each of their separate ways, are distinctly different, and for me, somehow, just doesn’t quite work. It’s too much of a change, and pulls me from the movies developed magic. Crikey: I guess if you were trying to make a word enter the popular global vernacular, like Streweth or Blimey, you’d stick it in a high profile film, repeat ad nauseum numerous times, and hope like hell the kids in the crowd copied it and used it on Facebook. 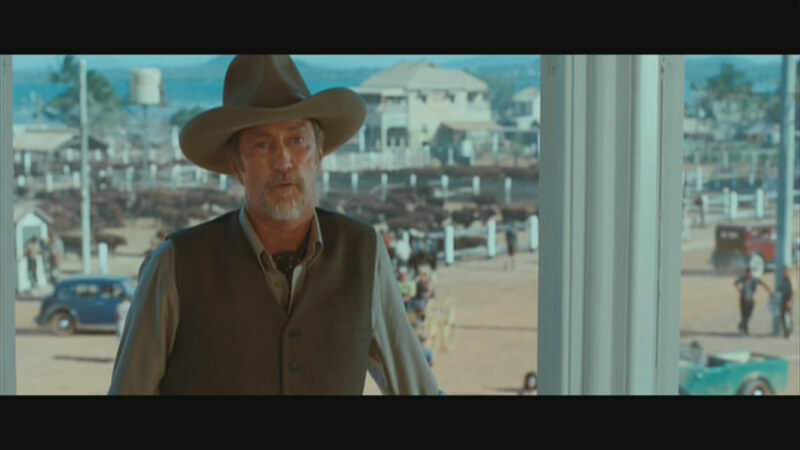 Akin to the awkward pause after the Crocodile Hunter tells a joke, the Drovers insistence on using Crikey as a swearing, cuss word, or a word engendering surprise, is annoying and clichéd. hackneyed to a point, it’s a giant slap in the face of Jackman’s ability as an actor to give him such trivial, and generic, dialogue. Used once, perhaps, it would have been funny. Twice would be milking it. After that, it’s plain annoying. David Gulpilil is again cast as the generic, wise old Aboriginal leader. I mentioned a few paragraphs up about Luhrmann’s handling of large scale action sequences, and called it good? Well, I was half right. The second act’s bravura moment is, undoubtedly, the bombing of Darwin by the Japanese air force. And, strangely, for a piece of filmmaking that should have been emotionally intense and thrilling, it left me a little flat. The direction of this sequence feels laboured, almost as if Luhrmann handed it over to a work experience student and said: stick the camera in a couple of places, set off the explosives, and I’ll whack something together later. The assault on Darwin feels flat, almost half hearted, with Luhrmann relying on the digital effects to tell the story more than his traditional style. Play the Cattle Stampede sequence back to back with the Darwin Bombing Run sequence, and you’ll appreciate what I mean. Luhrmann seems to be unfocussed here, perhaps trying to avoid comparisons with Private Ryan or Black Hawk Down and film a more suitable M Rated sequence…. it felt a little Matinee Move on Sunday to me. Hugh Jackman in full hero pose. Perhaps the biggest caveat with Australia is it’s singular lack of focus. Perhaps stemming from the divergence of tone and story between act one and two, the film feels a little disjointed, especially when Luhrmann tries to wrap the film up at the end, reverting from the realism of war to the mythical, magical landscapes and Aboriginal Dreamtime ethos of the opening act. Some story and plot points feel a little rushed and cobbled together, and the film’s main villain is unclear. Initially, it’s King Carney who is the films’ chief Bad Guy, and then, when the second act begins, Neil Fletcher steps up, and this is a little jarring for me. I found the sudden removal of Carney from the plot to be unclear, inconsequential and utterly contrived (in terms of the plot). The film tries to marry a balance of slapstick, tragedy and adventure in a hodgepodge of ideas and themes, and none of them gel well enough with the others to make a truly cohesive whole. Elements of the story are excellent: Sarah’s fish-out-of-water journey was done better in Crocodile Dundee, but is still fun to watch here. The Aboriginal themes, including the stolen generation and racism and bigotry, are handled well without resorting to cliché and cinematic tradition. The bond between Sarah and Nullah, and Sarah and the Drover, are almost excellent, yet don’t really come together as they did for Luhrmann in Moulin Rouge: the comical and semi-serious tones interchange so much you aren’t really sure if you’re supposed to laugh or cry each time. It’s a somewhat faux moment of cheese as Sarah approaches Nullah, whose mother has just passed away in a tragic accident, and proceeds to sing “Somewhere Over The Rainbow” from The Wizard of Oz, to try comforting the boy. This scene in particular made my jaw clench. But for all the style and attempted thematic narrative, Australia seems more an attempt to string together some pretty pictures with some pretty music and pretty actors. And to an extent, they succeeded. 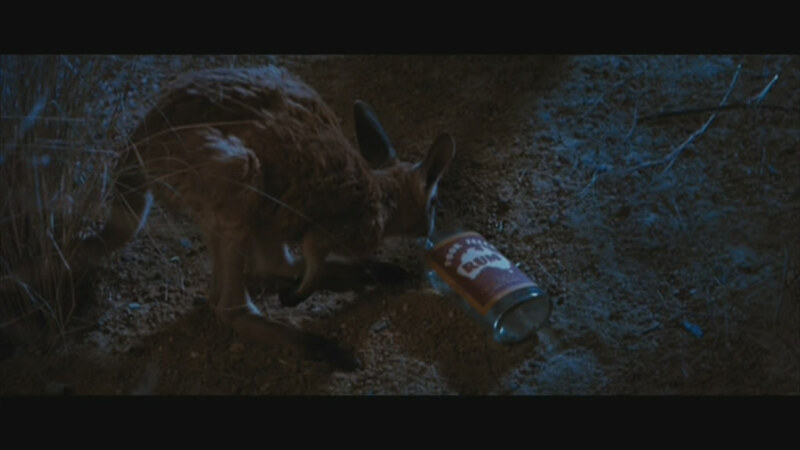 Even the animals in Australia like to drink. Look, I cannot sit here and say I didn’t enjoy Australia, because I did. I expected no less an entertainment package from Mr Luhrmann and Co, and I was not disappointed. Australia is far from being the perfect film, and no doubt there will be those detractors who will defy all expectations to tear down a massive cinematic triumph of story and art and turn it into a literal waste of money; I refuse to do so. I enjoyed Australia, and found it to be a simple, elegant, beautiful story of courage and determination wrapped neatly up in the colour corrected widescreen-filmed, emotionally overwrought style that is one of this country’s greatest cinematic stylists: Baz Luhrmann. yes it has some faults, and the film may not be to everybody’s tastes, and of course, there’s the folly of naming your film after an entire country, but I think Luhrmann has managed to accomplish yet another example of stylish, large scale entertainment, and that in itself is not something to be underestimated. 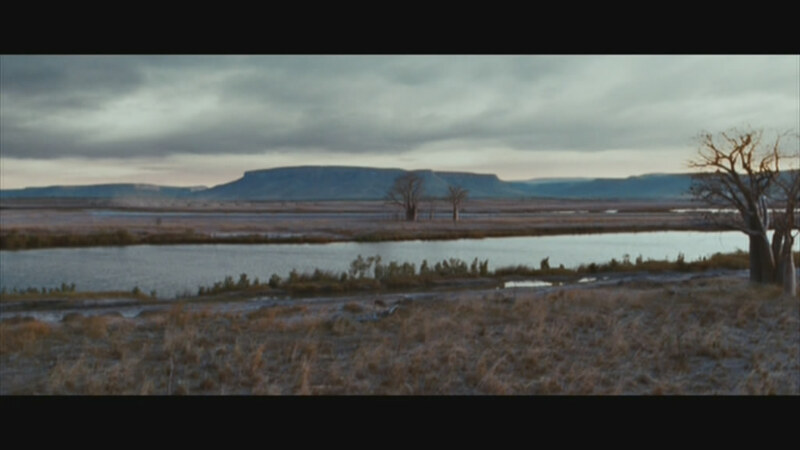 (2) Ms Walker's cinematography was absolutely stunning. Fair enough – this isn't an easy film to like if you're not a fan of Luhrmann's work… I am, so perhaps I was prepared to overlook more of the "melodramatic" elements the film contained, but I can see how this might have annoyed a lot of folks. Thanks for the words, Mark! Enjoyed the preview; disappointed by the film itself. My recommendation, watch the preview, forget the film! Indeed, the preview was pretty good!